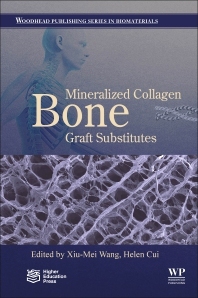 Mineralized Collagen Bone Graft Substitutes presents a comprehensive study of biomimetic mineralized collagen, synthesized in vitro, a next generation biomaterial for bone regeneration. By focusing both on fundamental research and the clinical use of this novel material, the book provides a complete examination, from bench to bedside. Chapters discuss natural bone and familiar biomaterials for bone repair, the preparation and safety of mineralized collagen, products made of mineralized collagen, and present clinical case studies. This book is an invaluable and unique resource for researchers, clinicians, students and industrialists in the area of orthopedics and dentistry. Dr. Xiu-Mei Wang is currently a full professor in the School of Materials Science and Engineering at Tsinghua University. She got her Ph.D. degree in Materials Science and Engineering at Tsinghua University, China, in 2005, and continued her postdoctoral fellow at the University of Rochester and Massachusetts Institute of Technology from 2005 to 2008. Her research mainly focuses on: 1) Engineering biomaterials to direct the stem cells fate; 2) Designing bioactive hydrogel to promote nerve repair and regeneration; 3) Biomimetic bone substitutes for cranial bone regeneration. She has authored over 150 publications, including peer-reviewed journal papers, book chapters, authored books, and patents relevant to biomaterials. She was honored “the State Natural Science Award” by the State Council of the P.R. China, Distinguished Young Scholar of Tsinghua University, and New Century Excellent Talents by the Ministry of Education of China. She serves as the co-Editor-in-Chief of Tissue Engineering C, editors of Frontier of Materials Science, Regenerative Biomaterials, and Biomaterials Research.